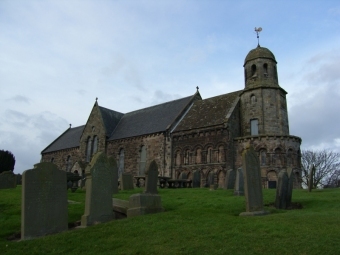 Leuchars is renowned for its long association with the Royal Air Force base and also the Church of St. Athernase which dates back to the late 12th century. The Church is one of the finest examples of Norman architecture in Britain and proudly stands on a grassy knoll overlooking the village. Originally the Leuchars area was a vast marshland at the mouth of the River Eden. Both the Church and Leuchars Castle, which was demolished in the 1970's - occupied the higher ground and secured a vantage point over the surrounding area. Extensive land reclamation about 1800 allowed Leuchars village to expand and the coming of the railway along with the formation of the RAF base helped to establish a prosperous community. Although the Royal Engineers had been experimenting with air balloons in 1911 it was not until 1917 that the Royal Navy Fleet Training School built an airfield at Leuchars. By 1920 the RAF base had been established as part of Britain's defence system. The RAF hold their Battle of Britain air display every September at Leuchars. North of Leuchars lies Tentsmuir - a wooded area where the primitive people of the Stone Age and Bronze Age were known to eke out an existence. The woods are now cared for by the Forestry Commission but access, complete with visitor facilities is available at Kinshaldy Beach. One of most relaxing, ways to visit Edinburgh is by train from Leuchars. Leuchars is ideally located for easy trips to St Andrews, Dunfermline, Culross, Perth, Edinburgh, Falkland Palace, and all of historic Fife.